Aquadyne 1000 - Model .30B Filtration system is excellently suited to filter ponds and other aquatic habitats up to 1000 gallons. The Model AD1000 comes standard with an Air Backwash system that performs just like the larger Aquadyne systems except in a small footprint package for smaller water features and ponds. Gph. 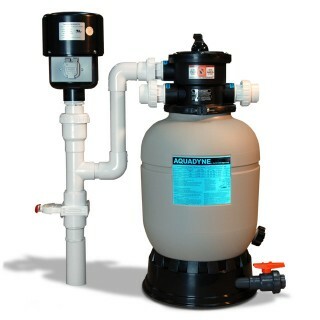 If you intend to use a submersable pump, please use the order number AD1000(S) for a submersable riser column. The Air Assist Backwash aggressively agitates the debris collected in the media bed and suspends it in the water column which is easily backwashed to waste, conserving water, and deep cleaning the filter media bed. The AD1000 is very suitable for an excellent indoor large volume aquarium filter. This unit is also an excellent starter for small laboratory research applications. Up to 1000 Gallons 30 Lbs. 500 to 3000 Gallons Per Hour 1 - 1/2 Inches 3 ea. Self Sealing 1 1/2" Unions Included 0 to 1 Psi at 2000 GPH on a clean cycled filter .30 Cubic Feet 11 Lbs. 14-inches x 33-inches 15 Gal. Up to 2000 Gallons 60 Lbs. 500 to 3000 Gallons Per Hour 1 - 1/2 Inches 3 ea. Self Sealing 1 1/2" Unions Included 0 to 1 Psi at 2000 GPH on a clean cycled filter .30 Cubic Feet 11 Lbs. 14-inches x 33-inches 15 Gal.